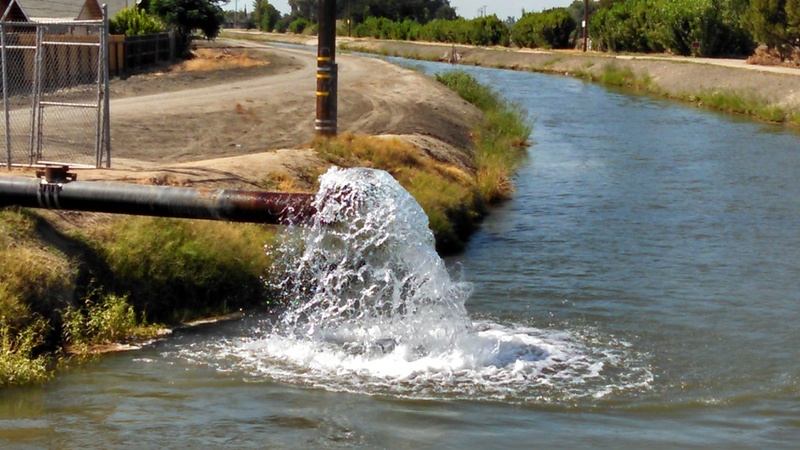 Groundwater is pumped into a canal in Firebaugh, California. State lawmakers hope to enact new regulations to bring groundwater use in line with availability. Click image to enlarge. A group of water policy leaders and California lawmakers will publish draft groundwater legislation for public review this week, possibly by Tuesday. The release kicks off a sprint finish for lawmakers and advocates hoping to use California’s historic drought to catalyze reform of the state’s lax groundwater laws. Groundwater accounts for 40 percent of the state’s water use in an average year and 60 percent or more during a drought. But in many areas groundwater is polluted and used unsustainably. The deficiencies are even more apparent this year, the state’s third consecutive dry year, as wells across the state go dry and groundwater pumping rates soar. The proposed rules, several of which still lack clarity, will require groundwater basins to set and meet performance standards, which they will propose. The legislation will require the state’s 127 high- or medium-priority basins – a definition based on water use and population – to adopt a groundwater management plan. The priority basins, most of which are in the Central Valley and Southern California, will have two years to form a governing body, five years to adopt a plan, and 20 years to reach “equilibrium,” a term that Orth said still needs to be defined. Once the legislature reconvenes August 4 from its summer break, lawmakers will have less than four weeks until the end of the session. In addition to groundwater, they will also be occupied with rewriting a multibillion-dollar water spending package that failed to gain approval before the recess. Orth is one of those with a seat at the negotiating table for the groundwater law. He is representing the Association of California Water Agencies (ACWA), an industry group that is one of several key players attempting to reconcile two groundwater reform bills that were passed by their respective chambers earlier this year. Senator Fran Pavley and Assemblyman Roger Dickinson, both Democrats, sponsored the two bills. ACWA and the California Water Foundation, a policy group, have been active participants, each drafting a set of recommended rules. Staff from Governor Jerry Brown’s administration complete the working group. Phone calls to Pavley’s and Dickinson’s offices were not immediately returned. After committee hearings next week, the bill is expected to come up for floor votes the week of August 17, Orth said. One of the difficulties of reform is the variety and jurisdictional complexity of California’s water management system. “Every one of the 127 basins is managed differently,” Orth said. Irrigation districts, county planning commissions, flood control districts, and public utilities are a few of the many managers. The resource is different as well. Coastal basins worry about saltwater intrusion – the ocean percolating inland as more groundwater is pumped. In the Central Valley, subsidence – when the land collapses like a person’s chest after a deep sigh – is the concern. But out of diversity must come unity. The legislation will require all entities to come together and create a single plan, said Orth, who uses a car analogy to describe the proposal. “The basins will have the same speed limit but the locals will decide what vehicle they want to use to get there,” he said. Once plans are approved, the basins will be accountable to the state and must meet five-year milestones. The goal is to avoid “undesirable results,” a term from case law that Orth said is still being defined. Examples of undesirable results include saltwater intrusion, chronic lowering of groundwater tables, subsidence, and pollution. How to quantify these conditions and which baselines to use are matters of discussion. One of the concepts most in flux, Orth said, is how to penalize basins that fail to meet their objectives. During these dry days, more and more water managers agree that the current path, where water can be pumped in many basins without permit or punishment, is not beneficial. Whatever ends up being in the groundwater legislation must include a repeal of Water Code section 13752, which gives California the dubious distinction of being the only state that forbids the public tom seeing groundwater pumping information submitted dot the State by those doing the pumping. It’s the public’s water and the public should have the right to know where it is going. Unless the state establishes a uniform, state-wide policy calling for the metering of all groundwater, any regulatory attempts by local agencies will be met with lawsuits, which are so expensive to defend that the local agencies will either not enact regulations, or will not enforce them. I’ve seen it, and seen the paralysis that results from this approach. Which is just what water interests want. 20 years to do something?? Give us a break!! Amazing that a State so progressive and after the experience of the early 1990’s drought (when groundwater was drawn down without limit as farmers leased their surface water to towns ( through the quickly formed State Water Bank ) has been so slow in doing the obvious. Check out the South Platte River in Colorado to see how to move in the right direction and what problems to avoid. Cheers!